Emily over at My Kawaii Space is having a Kawaii Blog Festa, and I couldn’t resist joining in! I like a lot of “kawaii” (cute) things, like Hello Kitty, Rilakkuma, cupcakes… but today I thought I’d write about something a little different – something traditionally kawaii. This is my collection of Japanese dolls. There are two kinds here – Kokeshi and Momiji. The short turquoise one in the middle, and the lilac one are Momiji dolls. 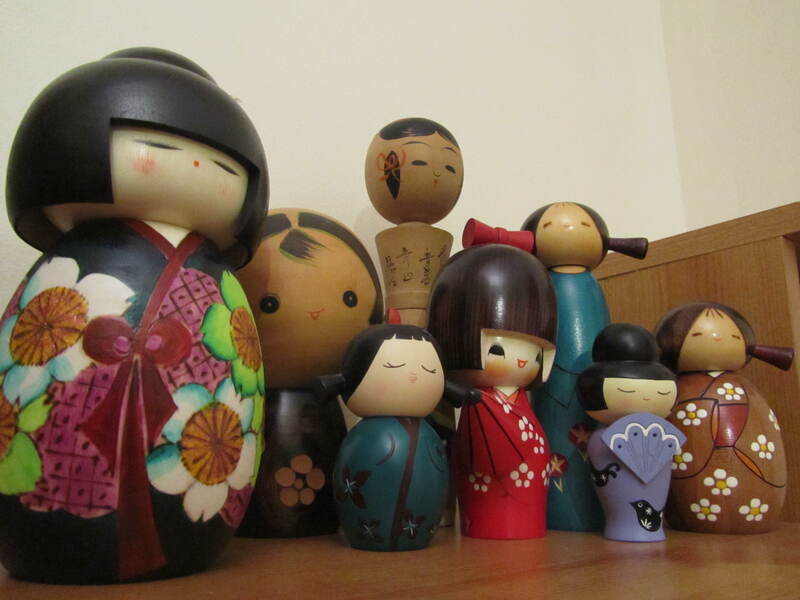 Momiji dolls are a brand of contemporary, collectible dolls. Each one comes with a blank piece of folded card inside for a message to be written on. These dolls are from the UK (although they are available all over the world), and inspired by traditional Japanese Kokeshi dolls. All the other dolls in the photo above are Kokeshi dolls which I picked up in Japan. The two older looking ones (the tall, skinny one in the centre at the back, and the short, round one second from the left) were ones I actually found at a flea market in Tokyo. All the others I bought in gift shops around Japan. There are so many designs available, and I found it really hard to not buy more. I’ll definitely pick more up next time I go to Japan! Kokeshi dolls are originally from northern Japan, and used to be popular souvenirs when people visited hot springs in north-eastern Japan. Now they are available all over Japan – there are some regional varieties, but also many designs which are available all over the country. It’s easy to find Kokeshi dolls in Japan if you go to a touristy gift shop in a place like Kyoto or Tokyo. They’re also available at Narita airport. You can find them in traditional shopping streets too, in places such as Nara. They can be a little expensive, but if you have time to check out a flea market it’s quite possible you’ll find one for a mere fraction of the usual price (although it will probably be a lot older and not as glossy as the gift shop ones). The ones I picked up at a flea market were only a few hundred Yen each, but the ones I bought in gift shops were a few thousand Yen each. If you’re interested in buying Momiji dolls (they make excellent presents), check out the official website. There are different collections available, and one particularly kawaii range is the Hello Kitty collaboration. Do you love kawaii things? Then you must check out My Kawaii Space and, if you have a blog, why not enter the Kawaii Blog Festa, too! I like the way you have them displayed. Super Kawaii!